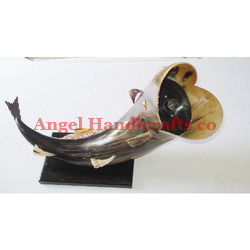 We have been recognized as a trusted name of the industry engaged in offering supreme quality Horn Flower Pots to the customers. Our range of products is ideal to enhance the beauty of the interior. In addition to this, we check these products on certain standard parameters to gauge their defect-free nature, before their delivery at the clients’ premises. We offer these pots to the customers at industry-leading prices. We are producing MOP Flower Stand. 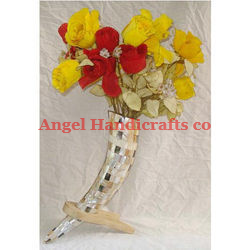 These flower stand has been produced from Cow, while the horns has been covered from mother of pearls & wooden Stands which hold the horns. 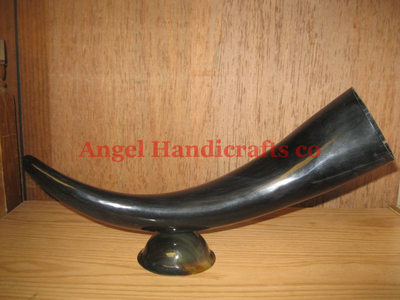 This size is 12" its finish is best & in top quality. Please send us your interest so that we can send to you our requirements. With long years of experience in the industry, we are able to offer a broad array of Horn Table Lamp that is demanded in many sectors. 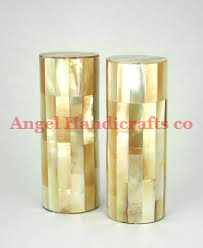 These lamps are designed carefully by our professionals using the best possible quality necessary material. Offered lamps are made available in plentiful designs, shapes and sizes, checked on a range of parameters before their closing dispatch.